Air quality is always on San Antonio’s radar, but for the attendees at the Regional Air Quality Strategy Session at Eco Centro April 5, it’s an urgent call to action. 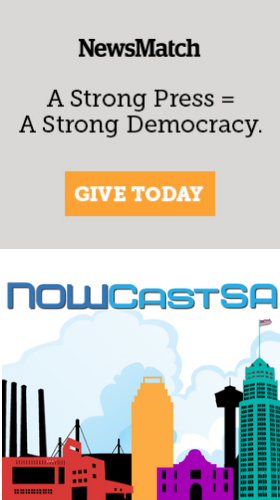 San Antonio city planners recently drafted “A Path Forward to Action,” a sustainability plan that, among other efforts, challenges employers to encourage employees to find new ways of commuting, including through busing and carpooling, with other policies focusing on heavy-duty trucks, airport, small business emitters, and large buildings, while also spurring economic development. The U.S. Environmental Protection Agency established new National Ambient Air Quality Standards last year, lowering the threshold for ground-level ozone from 75 parts per billion (ppb) in 2008 to 70 ppb 2015. San Antonio will likely be designated as a nonattainment area in October 2017, requiring area organizations to work with local government and business leaders to adopt new strategies to improve air quality. “Much of our outreach focuses on things people can do to drive less – there are many different control strategies available,” said Brenda Williams, director of Natural Resources at the Alamo Area Council Of Governments (AACOG), a planning council covering a 13-county region including San Antonio and Bexar County. AACOG aims to develop a cost analysis defining the economic impact to the Alamo region as the result of the nonattainment designation, and the group will evaluate and determine the costs of the controls to local governments, industries, and the general public under the air quality program. The event coincided with National Public Health Week, and members of the San Antonio chapter of the Texas Interfaith Power and Light organization urged stakeholders to develop an action plan to improve regional air quality, reduce ozone levels, and mitigate climate change factors. 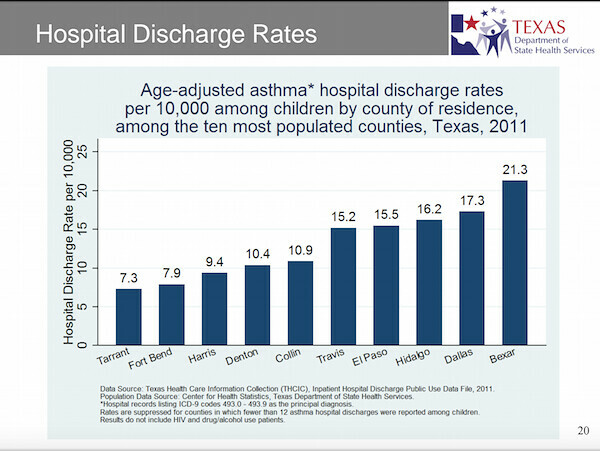 Asthma is a major problem resulting from air pollution in cities, with Bexar County ranking highest in the rate of child asthma hospitalizations among the ten most populated counties in Texas. The majority of those hospitalized and discharged were Hispanic children from ages zero to four, the agency found. Krystal Henegan of Moms Clean Air Force, an organization with 700,000 members nationwide, attended the meeting to stress the importance of teaching children about air and the environment. Henegan touted a new book, “Every Breath We Take,” that seeks to teach children how air moves and carries scents. Some participants were proponents of the Air Quality Flag Program, which alerts organizations to the local air quality forecast and helps them take action by flying different colored flags to alert people to daily air quality. Meeting attendees discussed parallel efforts to influence environmental policy, through story banking efforts like the National Public Radio program Story Corps, and by contacting elected officials. “You can use your voice in changing the course of environmental policy, in supporting an anti-idling ordinance,” said Mario Bravo, a Tom Graff Diversity Fellow with the Texas Air Quality Campaign and the U.S. Climate and Energy Program through the Environmental Defense Fund. San Antonio is working with AACOG to collect public comments through April 29 on a proposed anti-idling policy. The policy would cap idling time at five minutes for large vehicles - those with a gross weight of greater than 14,000 pounds or more. Violators would be penalized by local law enforcement. Such a policy would reduce unnecessary emissions from vehicles when they are not in use. Comments are being accepted through letter, phone call, voicemail, or email by the City of San Antonio Office of Sustainability, Bexar County and AACOG. In the interim, city staff are examining how such an ordinance would function and seeking public comment from drivers in industries that might be impacted. Douglas Melnick, San Antonio’s chief sustainability officer, said an anti-idling proposal should be ready to present to San Antonio City Council in the next two to three months. Chris Stewart, deputy chief of staff for District 8 Councilman Ron Nirenberg, said the city needs a more comprehensive, multi-tiered approach to air quality. Last Sept. 11, Nirenberg convened a roundtable discussion with a call to action for all AACOG regional industries and elected officials to reconvene in 90 days to publicly sign an Air Quality Early Action Accord outlining each representative’s meaningful voluntary pollution reduction actions. San Antonio city council members have held meetings to discuss air quality issues on military bases including Brooks City Base and Kelly Field, though no formal measures have been set in place. Other efforts to improve air quality can be made by examining the benefits of increasing tree canopy cover and encouraging businesses and developers to invest in planting native plants and installing green roofs and solar covers, noted Jessica Alderson, a wildlife biologist with the Texas Parks and Wildlife department who also attended the strategy session. What can you do now? Find out from the U.S. Environmental Protection Agency. Correction: As origianlly published, this article misstated the number of members in Moms Clean Air Force. The organization has 700,000 members. thank you -- I just added that to the story!